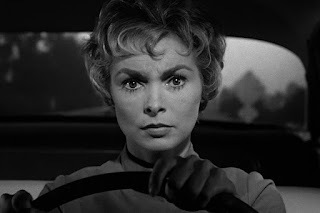 Janet Leigh in "Psycho." Is she worried about being hit with a spoiler? Years ago, my old friend Julianne Chatelain, a science fiction fan and one of the smartest women I know, remarked in a fanzine that she has little tolerance for suspense and that her custom is to read the end of a book before reading the rest of it. That seemed like a unique reading technique to me, but I see now that Julianne is not alone. Arthur Hlavaty, on his blog, writes, "Spoilers are one of those great emotional issues. Now, a study shows, unsurprisingly, that some people love surprises and suspense, and they hate spoilers, while others (me, for instance) find story suspense a discomfort no more edifying than excretory urgency, and they like spoilers." I am personally not a fan of spoilers. Years ago, shortly after I had started reading Anna Karenina, my ex-wife asked, "Has she thrown herself in front of the train yet?" It seems to me that one of the tests of a good book is that you know how it's going to come out, and you are willing to read it again, anyway. Certainly, re-readings of Pride and Prejudice can't be driven by wondering if Lizzie and Darcy are going to get together. It seems to me most mystery novels work by being only partially suspenseful. You may wonder quite how things are going to work out, but in a series about a particular detective, you don't normally worry whether the hero is going to solve the crime or manage to avoid being killed. Perhaps "Psycho" provides one of the biggest movie shocks of all time, because the view assumes he's going to follow the female lead's story all through the movie. You don't expect her to be stabbed to death early in the story. I would think that for most of Robert Anton Wilson's books, the pleasure is in the journey, rather than worrying about how the plot will come out. Surely that helps make Illuminatus! easy to re-read. The exception I think would be Masks of the Illuminati, which is really a detective story with two unusual detectives. Vladimir Nabokov said that not worrying about how it's going to turn out is what makes the second reading better. I love Nabokov, so I appreciate the anecdote.